In early 2013, Absolut teamed up with Threadless users for a crowdsourcing contest to develop a new limited-edition bottle for the latest city-inspired flavor, Absolut Chicago. Now, the brand is unveiling the results of the collaboration—an artwork created by Ross Bruggink, 26, reflects the city’s architecture and culture symbols that make Chicago a modern classic. The winning design by a participant from Minneapolis has been selected from 173 entries and generated over 156,000 votes within the community of 200,000+ graphic designers and illustrators. The clean and crisp stylized cityscape canvas highlights the architectural style of the city along with Chicago’s iconic visual elements such as hot dog, ferris wheel, pigeon, theatre sign and more. View all of the designs submitted to the challenge here. 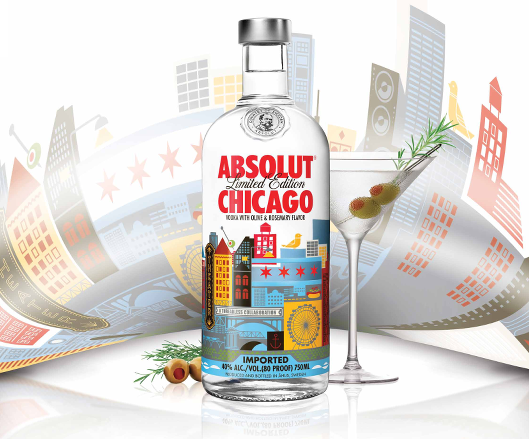 Absolut Chicago is the seventh flavor in the series of the brand’s U.S. city-inspired vodkas. The first one in the range, ABSOLUT New Orleans, was introduced back in 2007, followed by Absolut Los Angeles in 2008, Absolut Boston in 2009, Absolut Brooklyn in 2010, and Absolut SF in 2011 and Absolut Miami in 2012. The urban series also includes dedications to a plethora of other megalopolises including London, Moscow, Polakom and more. The latest product in the U.S. cities range is available in traditional 750ml bottles at a suggested retail price of $19.99. Posted in Design and tagged ABSOLUT VODKA, alcohol drinks, bottle design, crowdsourcing, Pernod Ricard, USA, vodka. Bookmark the permalink.